Popular TV channel SAB is known for best comedy shows like "Tarak Mehta Ka Ulta Chasma", "Tenali Rama","Partner", "Sajan Re jhhooth Mat Bolo" and "Jija Ji Chhat Per Hai". 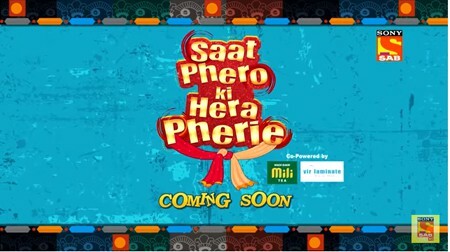 Now SAB TV is going to launch a new comedy serial "Saat Pheron Ki Hera Pheri" with comedy vetran Shehar Suman.This serial is the most awaited because Shekhar Suman is coming back to the Indian Television after long time. Shekhar Suman : Shekhar Suman is popular commedian known for work in Bollywood films and TV Shows. He worked in Hindi film Bhoomi, Tridev and TV shows Comedy Superstar, Hera Pheri and many more. After long gap he will come back on TV show. Swati Shah: Swati Shah is a popular TV actress known for work in "Baa Bahoo Aur Baby", "Teen Bahuraniya" and "Tere Mere Sapne", Saathiya Saath Nibhana and Beyhad. Ami Trivedi : Ami Trivedi is an Indian television and theatre artist. She is most known for her roles of "Kittu" in Kituu Sab Janti Hai and "Kokila" in popular comedy sitcom Papad Pol. Amit Mistry : Amit Mistry has worked in popular movies like Kya Karein Kya Na Karein - K3nk , Hum Hai.